In America Josh Rosebrook & his skin & hair care products have a cult beauty following, but it would be fair to say that he also is steadily building a loyal following on the British shores as well. In part, because Josh is very vocal on the subject of being a genuine artisan who works alongside the nature and not against it. Our bodies are amazing creations with the power to heal itself, if only we listen attentively to the signals it sends us and Josh harnesses the power of plants, nuts, fruits, herbs, stems and leaves in order to create skin and haircare products that will assist our bodies and skin functioning at its best. 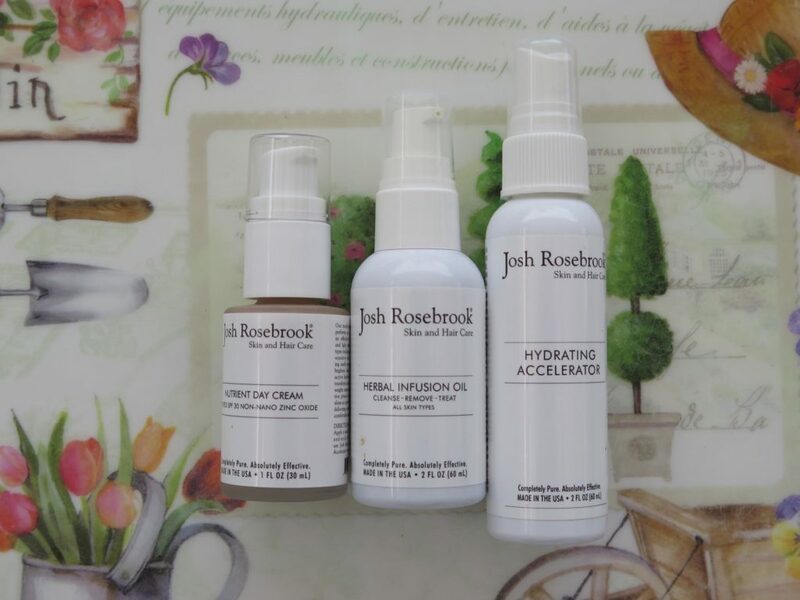 It is an added bonus that Josh’s products smell so beautifully that they help slow down the time and make you fall back in love with your skin due to the daily skincare rituals. My own discovery of Josh’s products started, interestingly enough, with haircare, when I bought samples of his ‘Deep Nourishing Shampoo‘ and ‘Deep Nourishing Conditioner‘ on A Beautiful World website. They smelled beautifully of plants and oils and didn’t lather up my hair in the way that regular shampoos do, but my hair and scalp appreciated the products ( just make sure you wash the products off thoroughly, otherwise your hair might look greasy ) and I pondered trying the skincare as well. This July Josh added two new skincare products to his range ( which are available to order via ABW ), a Tinted Nutrient Day Cream with SPF 30 and a Herbal Infusion Oil Cleanser and both products had me at a sniff, even before I packed them in my skincare summer kit ( I don’t pack lightly when it comes to skincare and make-up when I travel, but this year was a turning point in some ways, more of which later ). According to Josh, daily process of cleansing the skin properly ” is the first step to removing unwanted bacteria, dirt, pollution and imbalanced or excessive oil that can cause inflammation and disruptions to the skin, such as blemishes and problem skin. A gentle, ph-balanced Cleanser that delivers transformative nutrients into the cells is essential to both reinforce moisture protection and preserve the skin’s natural defense system, the acid mantle barrier. Daily practice facilitates balance and a healthy cellular response resulting in a clearer, brighter complexion”. His newly launched cleanser comes in a simple white packaging with black lettering, yet one inhale of that product will take you back to nature – imagine a mixture of apricot and almonds, calendula and damask rose, as well as notes of green tea? Well, all those ingredients are only part of a bigger sensory experience. This cleansing oil was developed to ‘cleanse, remove, treat’ and in actual fact will work as a cleanser, make-up remover and a facial treatment for your skin. I tried it shortly before going on a holiday and as I mentioned earlier, using it was such a pleasure, that instead of taking a few cleansers I took just this one, alongside my trusty side-kick that is Nourish Kale Enzymatic Cleanser that I use regularly as scrub and mask. This cleansing oil was developed to ‘cleanse, remove, treat’ and in actual fact will work as a cleanser, make-up remover and a facial treatment for your skin. Dispense one pump of the oil ( unlike many dispensers, this one pumps out a small amount that is actually perfect for one use ), massage it all over face and neck and ‘then firmly press soft dry cloth over face’, according to the instructions on my bottle. Reading it I was a bit baffled, so I either massage my face with Foreo or take it off with my warm muslin cloth – either way the skin feels luxuriously soft to the touch. What you do after cleansing, is up to you – you can apply your usual face serum/cream or spray your face with Josh’s heavenly scented Hydrating Accelerator, followed by a pump of the herbal infusion oil, spreading it all over face and neck & inhaling the soothing, uplifting and fresh aroma reminding you of summers in the countryside, walking barefoot in the middle of the fields. I also absolutely must pause to mention Hydrating Accelerator ( it comes in two sizes: 60mls, for £16 or 120mls for £29 ) that was developed to help boost your skin’s hydration. While its use enhances your serum or day cream, it is a faithful and worthy companion during the travels or by the side of your desk, as its scent will ease the tension we accumulate in our faces, while also protecting your top skin layer from bacteria and plumping up fine lines – it deserves a beauty hero-worship & all the accolades you have already heard or read about it. I test all kinds of face oils on a regular basis but this product really impressed me in a gentle manner – even its texture is unusual, as it feels both dry and wet at the same time. It smells beautifully, making you feel uplifted yet relaxed, it is gentle, yet effective in taking all the daily environmental debris and make-up off and leaving your face as a radiant canvas, ready for good sleep or the day ahead. And the fact that it is a multi-tasker is an added bonus to an already perfect package. Organic Oils of: olive, jojoba, sunflower, grape seed, sesame, apricot, almond; Organic Herbal infusions of: calendula, slippery elm, marshmallow root, bilberry, neem, alfalafa, skullcap, fennel seed, chickweed, ginko leaf, hawthorn berry & green tea; Organic essential oils of: rosewood, damask rose & proprietary blend of other organic essential oils. Well, if someone puts forward a product that is a multi-action day cream, a natural sunblock, as well as a light make-up, how can you not be keen to try it out, especially on a holiday when the pace is slower and you want to make an effort, yet not be too vigorous with it? This day cream acts as a rich moisturiser ( it is suitable for all skin types, including acne-prone and sensitive, according to the label ) but it feels quite light-weight on the skin – a great surprise, particularly in humid and hot conditions, when even the light-weight formula can feel too heavy. The smell of freshly baked cookies with chocolate chips is a delight without the added calories and it glides easily over your skin ( but with an initial slightly sticky feel ) making your skin look like an even, soft, almost flawless canvas – almost, because you can still see your freckles or moles, if you have them – after all, who wants complete perfection and knows what it looks like? When I used this moisturiser on hot, summer mornings I used Hydrating Accelerator prior to application, let it sink in for a minute or two and then dabbed the moisturiser all over my face. Thanks to colour-adjusting earth minerals, like mica, in this moisturiser you skin tone will be corrected and brightened, while plant oils and herbs will repair the skin matrix. You can use it as make-up primer if you want a bit more coverage, with a BB cream on top for example ( this formula is feather-weight and lets your skin breath ) or use it on its own if you want a truly natural look with a smooth finish – either way, your skin will have a healthy glow, even when the holiday is over and daily routine takes its place instead. Ingredients: certified organic aloe juice & shea butter; organic oils of: evening primrose, hemp seed, jojoba, borage, almond, grape seed, sesame & sea buckthorn; minimum 12% zinc oxide; certified organic lecithin; organic herbal infusions of: calendula flowers, bilberry, chamomile, burdock root, rosemary, fennel seed, dandelion, rose hips, catnip, chickweed, neem leaf, skullcap, ginkgo leaf, linden flowers, hawthorn berry, green tea, flaxseed, nettles, sage, marshmallow root, cayenne, ginseng, peppermint, st. john’s wort and alfalfa; certified organic vitamin E oil, wild-crafted candelilla wax, certified organic guar gum & gum arabic; plant sourced xanthan gum & potassium sorbate; mica; organic benzoin tree resin. I love using this product because it moisturises and looks after my skin by providing anti-inflammatory and antioxidant protection, while also protecting it from harmful sunrays and allowing me to look good, even on the days when I feel tired or have gone to bed late. In some ways this product defines what natural beauty means to me, by treating and enhancing my skin naturally, by harnessing the power of nature and sunshine and letting my skin look its best while concealing the imperfections or improving them in a subtle but noticeable to me, when I look in the mirror, way. And when you are confident, you can move mountains, be it in your personal or professional path. I agree that we are individual in our own, as well as our skin’s preferences, and what might work brilliantly for one, might be a bit disappointing for another. That’s why it is important for women to know what suits their skin and make changes depending on seasons, age, hormones etc. and not necessarily have high hopes for the products just because they were mentioned by the press or reviewed by the bloggers – each one of us can only talk of her own experience with this or that product & each review is bound to be subjective. Like you, I had disappointments in the past of a similar kind. It’s not always possible but it really helps when brands engage with their customers and give them advice tailored to individual needs, but even with all good will in the world some products are loved by some and not be suitable for others.